Late afternoon on 12 February an inspiring caravan made its way into Makhanda (Grahamstown). 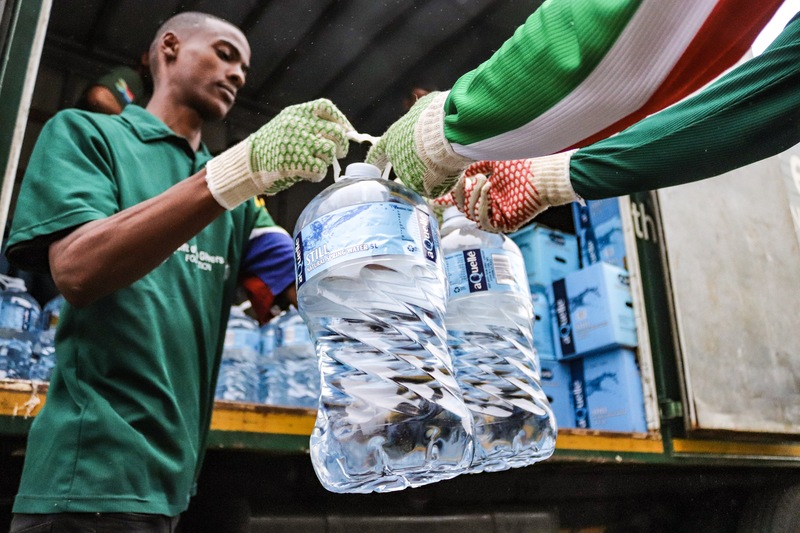 Green trucks emblazoned with the Gift of the Givers emblem emerged from the thick mist on the N2, A total of six trucks and a handful of bakkies brought with them the promise of relief for residents – some who had been without water for up to nine days. The Gift of the Givers was notified of Makhanda’s water crisis last weekend and by Monday morning, trucks from Durban, Cape Town and Johannesburg were loaded to the brim with bottles of water. Operational problems at James Kleynhans Water Treatment Works which supplies Makhanda East have left some residents without water for a week or longer. On 1 February 2019, the Department of Water and Sanitation, (DWS) released water from the Fish River scheme to the Glen Melville dam whose water level was low and the incoming supply from the Fish River agitated the sediment resulting in high turbidity level measured at 1000 NTU. No water could be treated at the James Kleynhans Water Treatment Works as the plant is not designed to handle such high turbidity. The incoming turbidity is normally at 80 NTU which is already too high for the plant. On 7 February 2019, the raw water turbidity when tested was beyond the turbidity meter calibration. Since 6 February 2019, the treatment process could not remove the turbidity to acceptable levels and hence the clear water pumps had to be shut down. This meant that no water could be delivered to the Makhanda East community. Accompanying the team is Gift of Givers water ‘guru’, Dr Gideon Groenewald. Groenewald works as a hydrologist for the organisation and specialises in drought relief strategies and siting water for boreholes. He explained that the role of the Gift of the Givers at this stage is just to solve the immediate crisis, not the long-term issues. Groenewald said they might also look at the possibility of drilling a number of boreholes in Makhanda. 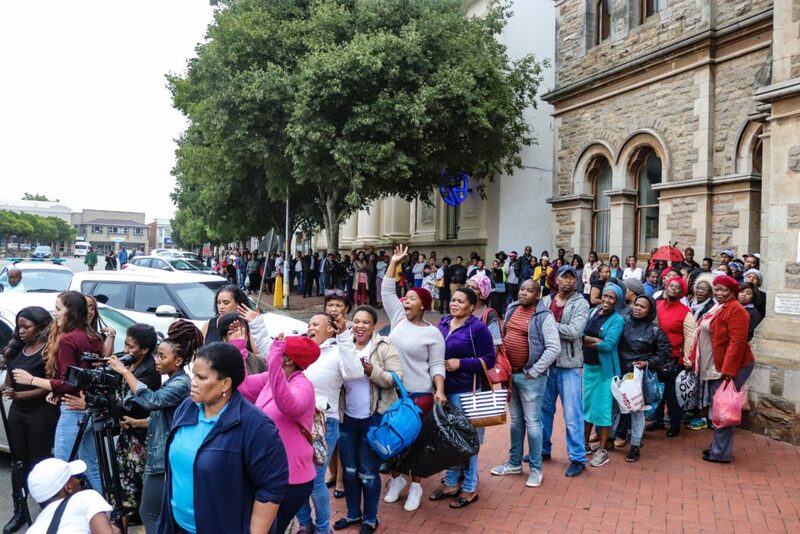 Because the convoy arrived later than expected, distribution took place today in accordance with the schedule that was available on the municipal website www.makana.gov.za and on their Facebook page Makana Local Municipality Communication the Communications Officer said. A press briefing followed the caravan’s grand entrance with Executive Mayor Mzukisi Mphalwa, Groenewald, Councillor Ramie Xonxa, Gift of Giver’s Ali Sablay, Director of LED and Planning Riana Meiring, and other Makana officials and councillors. Mphalwa kicked off the briefing, assuring press that the lack of water since last week was due not to “incompetence or sabotage”, but the accumulation of sludge in the James Kleynhans water treatment facility from the Glen Melville Dam. Mphalwa said the issue was being addressed by engineers and staff. A Makana engineer informed of the current dam levels that supply the west side of Makhanda, with Settler’s sitting at 11.3% and Howieson’s Poort at 21.1%. Should Settlers drop below 10%, the west side would be switched over to the James Kleynhans system. 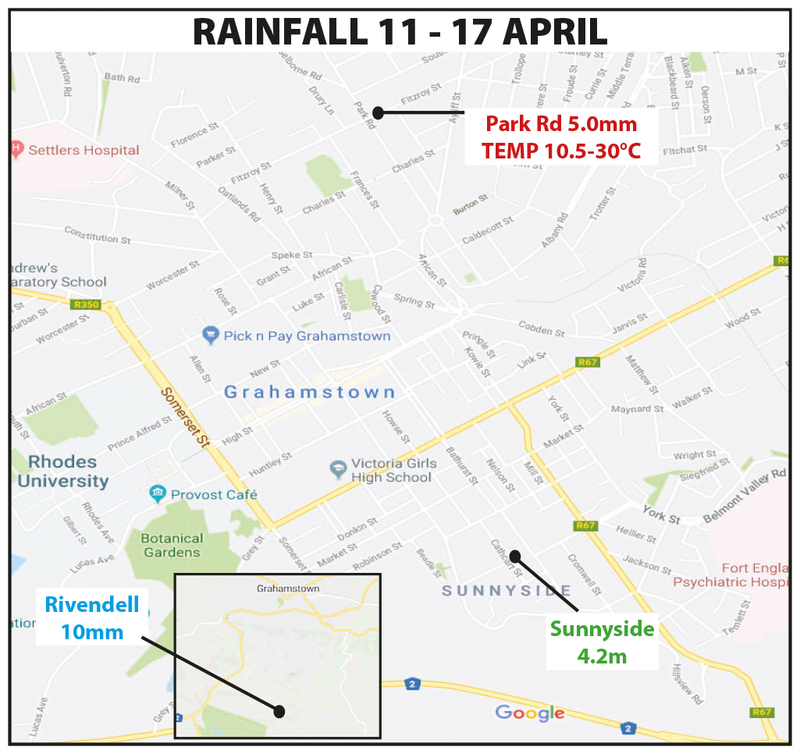 This will mean the 10 megalitres produced by James Kleynhans when it is at full capacity will be shared across the whole city, which currently uses 18ML a day. Water was to be distributed to priority areas first, such as schools and hospitals. 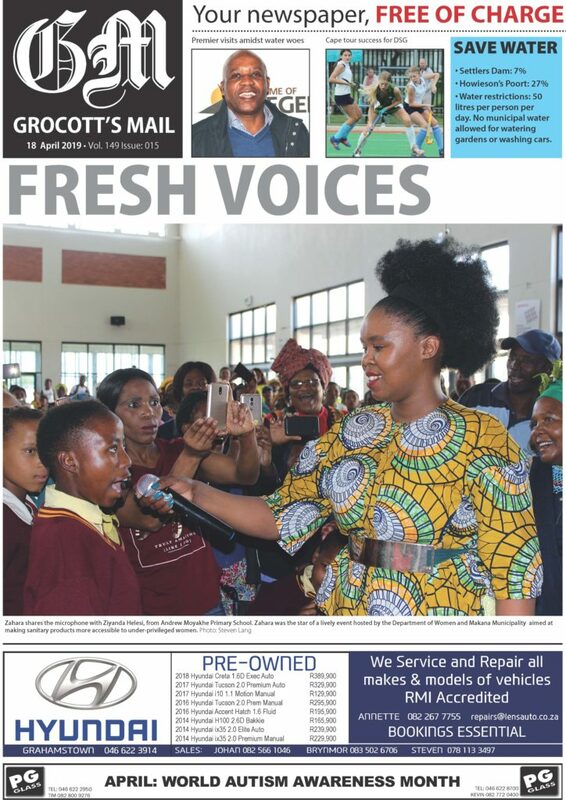 Grocott’s Mail was assured that rural communities would be attended to during the week. 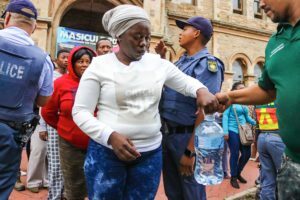 Meiring commented that Fort Brown and Seven Fountains had “adequate” water, adding that a Makana water truck would be filling up in Seven Fountains to visit nearby farms. Following the press briefing, one Gift of Givers truck distributed five-litre bottles to a long queue of residents. Cheers and smiles filled the space as the truck was quickly emptied. Full distribution began 13 February with the promise of more trucks coming throughout the week. Since the organisation’s arrival they have met with Makana to discuss long-term solutions such as boreholes, and other drought relief strategies. On Thursday 14 February, Gift of the Givers founder Imtiaz Sooliman confirmed to Grocott’s Mail that a rig for drilling boreholes would leave its site in KwaZulu-Natal this Sunday and would likely arrive in Makhanda on Monday.